Orchids have the reputation of being finicky. Many types do require exacting moisture, growing medium, humidity and light conditions. 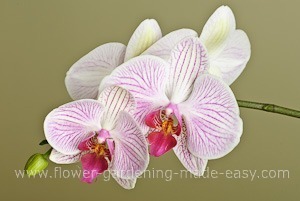 But if you don’t feel like cosseting a cranky plant, there is a gorgeous one for you: the moth orchid or Phalaenopsis. 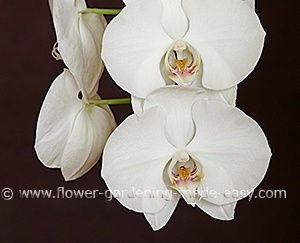 Phalaenopsis produces lavish, long-lasting sprays of flowers. Depending on the species, plants have three to fourteen blooms in white, pink, yellow or mauve that last three to five months. In nature, these plants usually grow in trees as epiphytes (air plants) so their needs are different from other houseplants. But “different” doesn’t have to mean complicated. Temperature: Average temperatures of 70 to 80ºF (21 to 26ºC) during the day, and night temperatures of 60 to 66ºF (16 to 19ºC) are ideal. Keep plants out of cold drafts. Light: East or north-facing windows are ideal; west windows will work if they have sheer curtains that keep out direct sun. The plants’ roots, which grow at the base of the leaves and stick into the air, should look thick and fleshy. In winter, grow slows, but as temperatures rise and light increases, you’ll notice green tips growing on the roots. Watering: Drench pot by letting water run through; do this at the kitchen sink. The growing medium is loose and airy so water will run right out of the pot after you wet the medium. Water every one-and-a-half weeks in winter, and once a week in the summer. Most problems with Phalaenopsis result from over-watering, so don’t let the plant stand in water and don’t let water sit in the crown. Fertilizing: Fertilize year-round with water-soluble 20-20-20 mixed at half strength with each watering. Some growers recommend a higher nitrogen formulation of 29-14-14 at one quarter to half strength given with every watering. When a new flower stem emerges, switch to a 10-30-20 formulation at one quarter to half strength to encourage more and larger blooms. Humidity: Adding humidity, especially in the winter when it can get very dry indoors, is helpful. Setting your plants on a tray of pebbles partially filled with water is ideal, but make sure the pot doesn’t sit directly in water, as clay pots can easily absorb moisture. Occasional misting is helpful, as is grouping plants together. Re-blooming: It takes three months for a new flower spike to grow and open. A cool period between 60 to 68ºF (16 to 20ºC) encourages re-blooming. Flowering begins during the winter. After blooming, cut flower stem off at the base.